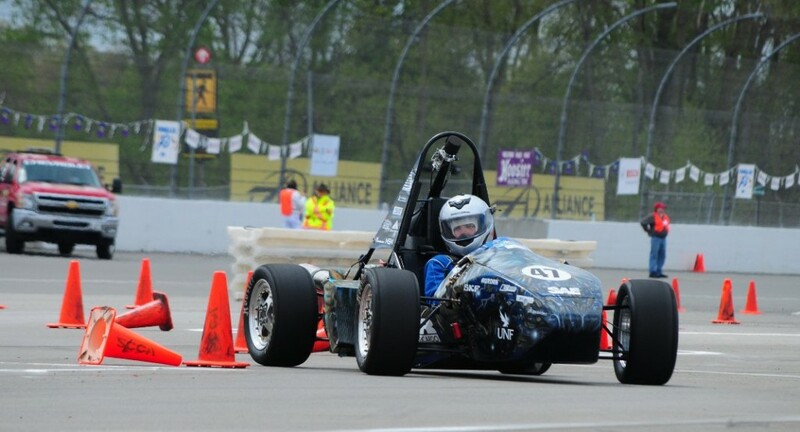 Each year, over 120 teams from all over the world, travel to Michigan International Speedway and compete in a four-day long engineering competition. Each student team designs, builds, and tunes a formula race car based on a series of rules whose purpose is to ensure engineering safety and promote clever problem solving. Teams compete and earn points in two types of events: static and dynamic. The team with the highest combined score is declared the winner. Evaluates the team’s ability to develop and deliver a comprehensive business plan. The car must be profitably manufactured, marketed, and meet the demands of the racing market. Judges the effort that went into the design of the car. The car that illustrates the best use of engineering to meet the design goals will win the design event. Cost and budget are significant factors that must be considered. Teams must make decisions between cost and benefit. Teams will create and maintain a Bill of Material. Cars will accelerate over a distance of 75m on a flat surface. Measures the car’s cornering ability while making a constant-radius turn. Drivers will be required to make laps around a small figure 8 course. Evaluates the car’s maneuverability and handling qualities on a tight course without the hindrance of competing cars. The autocross course will combine the performance features of acceleration, braking, and cornering into one event. Tests the overall performance of the car and the car’s reliability. The car must drive 22km with mandatory driver change. The fuel consumption is measured.